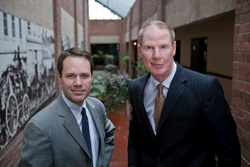 Attorneys Garrett and Preston Handy, of Handy & Handy, P.C., named to Utah’s Legal Elite for personal injury practice. This is the fourth consecutive year this honor has been bestowed on us. It is a great honor to be voted the best by our peers in the legal field. The list of Utah’s Legal Elite is compiled from surveys completed by thousands of Utah State Bar members who are asked to identify attorneys they deem the best in the state and whose legal services they would recommend to others. “It is a great honor to be voted the best by our peers in the legal field,” said Preston, who has been handling personal injury cases since 1994. The personal injury attorneys at Handy & Handy have a combined 30-plus years’ experience. Preston and Garrett gained valuable experience in handling thousands of cases as Salt Lake City personal injury lawyers, and built on that experience by starting their own law firm. Today, they are revered for their aggressive representation, positive case results and superior client relationships. About Handy & Handy, P.C. Handy & Handy focuses exclusively on personal injury. Practice areas include motor vehicle accidents, wrongful death, brain injury, product liability, dog bites/attacks, slip and fall, premises liability, motorcycle accidents, auto-pedestrian accidents, bicycle accidents, skiing accidents and trucking accidents. For more information, please call (801) 264-6677, or visit http://www.handylawutah.com. The law office is located at 2150 South 1300 East, Suite 300, Salt Lake City, UT 84106.